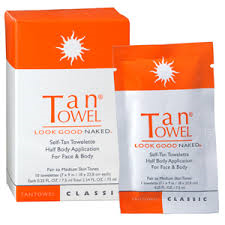 Tan Towel Half Body PLUS - 10 Pack TanTowel Half Body PLUS Self Tanning Towelettes offer the same convenience as the original TanTowel in a deeper tan suitable for medium to dark skin tones or frequent tanners. One towelette will cover half of the body. The pulp fiber exfoliates as you apply leaving your skin soft, smooth and evenly tanned. 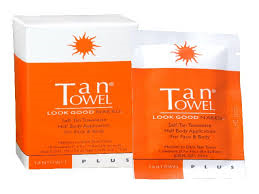 You gauge the level of tan by the number of towelette applications. TanTowel has a refreshing citrus scent but will not compete with perfume or cologne. The fragrance will dissipate within 5 minutes.